Your brain peaked when you were twenty–what to do? This is one of my occasional health related posts. The next area of focus for me as I seek to slow the process of ageing is the brain. Physical fitness is a pre-condition for mental longevity, so I was right to start there, but the statistics (such as they are) on the physical decline of the brain after the age of twenty make for terrifying reading. The average human brain weighs around 1.5kg (3lbs), has a volume of around 1,200 cubic centimetres and contains 80-120bn neurons. The reasons for the decline in mass are still poorly understood. Until a couple of years ago there was consensus that our brains shrink with age because large numbers of neurons die, but now some people are thinking that it is due to a decline in the volume of cellular fluid. As well as shrinking in mass the brains chemical and hormonal functions change with age. This is even less well understood, but it appears that the brains ability to expand certain regions to learn new things (it’s plasticity) declines, and the production of key pleasure hormones dopamine and serotonin works less well. So far, so morbid. The good news is that there are things we can do which stand a chance of arresting the decline (although nobody knows for sure). Firstly there are the common sense items – sleep well, eat well, stay fit, keep active, and avoid stress. Secondly, treat the brain like a muscle – use it and it will stay strong. Actually, the brain is more like a group of muscles that have to be exercised individually – one for emotions, one for physical co-ordination and one for logical computation. There seems to be widespread consensus that the best way to overall brain health is to work on all three – spend time with people you love, engage in activities which require tricky co-ordination, and do the crossword! Change is also important – seek out new people, try new sports, and switch to soduku every now and again. The third area is where things are interesting for me right now, and that is supplementation. This is also the most controversial. None of the supplements I mention below are being sold with FDA approved claims about brain health or anti-ageing – i.e. none of them have effects which are proven to the satisfaction of the regulator. However, many have positive indicators from small scale trials and chemical or biological reasons to believe they might have a beneficial effect. Over the next 5-10 years I expect some of them will go on to be accepted by regulators and move into widespread use. I’m 39 now which means my brain will enter its ‘progressive shrinking stage’ soon and I’m strongly minded to take advantage of the latest helpful technologies today rather than waiting for a decade by which time some regions of my brain might have shrunk by 5%. If you had asked me a week ago I would also have had Vinpocetine on the list. Vinpocetine increases production of adenosine triphsophate, the brains energy source and many people take it because it makes them feel more alert and able to concentrate for longer. However, after finding this discussion about negative side effects I think I will probably give it a miss. Similarly I’m going to give geranium stem (aka dimethylamylamine, methylhexanamine and DMAA) a miss. It’s supposed to provide a long caffeine like buzz without the downside, but there’s no such thing as a free lunch. My primary source for this has been Transcend by Ray Kurzweil and Terry Grossman, but I have also read websites too numerous to mention. Any thoughts on the above would be much appreciated. It’s a big step to start supplementing for brain health, and I want to think it through properly. Simply writing this post has helped a lot. I was shocked when I saw this table in the Economist on Friday. In general I think that a little fear failure is healthy, without that entrepreneurs wouldn’t think through their chances of success properly, but that too many people use it as an excuse for not starting businesses, or as a cheap explanation for why our startup ecosystem lags the US (I wrote about this in more detail in 2007, and my views haven’t changed much). Failure is a multi-headed beast, and bankruptcy is one of many things that would-be entrepreneurs have to worry about, but it sets the tone for how a nation thinks about business failure is easy for governments to change. 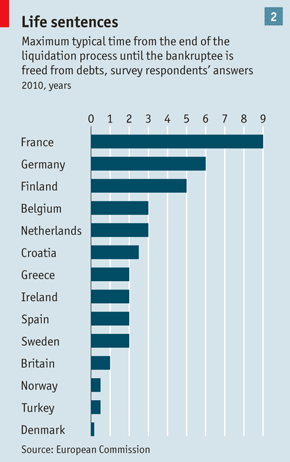 What leaps out from this chart is the difference between France and Germany on the one hand and the UK on the other. The sad truth is that bankruptcy laws give entrepreneurs in two of Europe’s largest economies good reason to fear failure. Nine years is much too long a time to be stuck with debts if you go bankrupt. There is, of course, a balance to be struck between encouraging people to start companies and protecting creditors, but I think we have that about right in the UK. I hear occasional stories about unscrupulous entrepreneurs here who get credit from other startups, don’t pay, and then use the bankruptcy laws as a shield as they go about their business seemingly unencumbered by the fact that they owe somebody else money, but they aren’t too frequent and I don’t believe that the prospect of bankruptcy inhibits many people in the UK from starting companies. I doubt the same is true in Germany and France. My friend Sokratis posted a link to the video below in a comment on the post I wrote Wednesday about building habit forming consumer services. The main point of that post was introducing Nir Eyal’s concept of the Desire Engine – a trigger, action, (variable) reward, commitment loop. In the video behaviour change expert BJ Fogg unpacks the first two steps – exploring the circumstances under which people respond to a trigger and take an action (or behaviour in Fogg’s parlance). For me the four takeaways from the video are below, but they don’t come close to doing justice to the richness of understanding you will get from watching Fogg’s talk in full. Build (or invest in) services where the desire or motivation is already there – all big successes on the consumer web have done this – find stuff on the internet, stay in touch with my friends, buy stuff..
Behaviours (actions) only happen when motivation, ability to complete the action, and a trigger are present at the same time. Fogg puts that in a formula – B=MAT. After that it is better to work on the ‘A’ in B=MAT than the ‘M’. Making it easier for people who are motivated to use your service (i.e. increasing their ability) is sticky – if it is easier today it will be easier tomorrow, but with motivation you have to start from scratch every day. This is counterintuitive. For many the first thought is how do I make my service better – i.e. increase motivation. I think it is the social scientist in me that enjoys these frameworks so much. By themselves they don’t provide any answers, but I find them very helpful in breaking complex issues into manageable chunks. Public markets not well equipped to deal with the accelerating pace of change? You may have seen that investors sent Zynga’s shares down by as much as 40% in after hours trading last night, taking the share price to $3, which is 70% off the level of their mid-December IPO. The business is still growing – revenues were up 19% to $332m for the quarter – but losses widened and the company slashed its growth targets. This is a similar story to GroupOn (share price off 74% since it’s November 2011 IPO) and even Facebook (share price off 26% since its May IPO). Which raises the obvious question of why IPO investors are making these mistakes. The most common answer is that gullible investors hungry for growth stores were duped by greedy management teams and clever bankers, and that is a partial explanation, but I wonder if there is something more going on here. I wonder if part of the issue is that the discounted cash flow (DCF) methodology bankers use for valuing companies is letting them down because it doesn’t deal well with rapidly changing markets. Those of us with a fondness for finance will argue until we are blue in the face that discounted cash flows (DCF) are the true drivers of value for any financial asset, companies included. The problem is that it is nearly impossible to predict with any accuracy what the long-term cash flows are for a given company; especially a company that is young or that might be using an innovative and new business model. Additionally, knowing what long-term cash flows look like requires knowledge of a vast number of disparate future variables. What is the long-term growth rate? What is the long-term operating margin? How long will this company hold off competition? How much will they be required to reinvest? Therefore, from a purely practical view, the DCF is an unruly valuation tool for young companies. This is not because it is a bad theoretical framework; it is because we don’t have accurate inputs. Garbage in, garbage out. DCF is now inappropriate for public companies like Zynga, Groupon and Facebook for the same reasons it is inappropriate for startups. Their markets are changing so fast that inputs to DCF models aren’t accurate. I want to finish with two caveats – firstly I’m not an investment banker, and write from suspiscion, not experience, and secondly (for all you DCF lovers) there is nothing wrong with DCF from a theoretical perspective. As Gurley says discounted cash flows are the true drivers of value for any financial asset, my point is that the practical challenges in using DCF for startups now extend to public companies. I’ve just spent an hour reading the excellent nirandfar blog by Stanford psychology and business lecturer Nir Eyal. The most important post sets out Nir’s concept of the Desire Engine which is a framework for building habit forming services. His other posts explore elements of the framework in more detail (e.g. building commitment by making users do work, and how to hook users with variable rewards) and case studies (e.g. Instagram). What follows is a summary of the core elements of the theory which I hope will a) firmly cement the framework in my mind, b) convince many of you to go and read Nir’s work in full (if you are responsible for designing or building a consumer internet service then you really should), and c) serve as a quick intro for those of you who are time challenged. I’d love to get your reactions. As always. The centrepiece of Nir’s theory is that successful sites push users through the four steps of the Desire Engine every time they visit. The first step is the trigger that takes them to the site – that could be an email, a post on Twitter or Facebook, or it could be a thought or emotion that occurs to the user and makes them reach for the service (an internal trigger). Next comes the action the trigger is designed to precipitate – that could be clicking on a link in the email to go to the website (responding to an external trigger) or sharing a photo of something beautiful you’ve just seen on Instagram. Third up is the reward. This is where the theory gets interesting. Two points stand out for me here – firstly the reward has to be amazing, and secondly the reward shouldn’t be the same every time. Giving the user an amazing reward is hard enough – Facebook gets you pictures of last night’s party, and Twitter gets you breaking news or amazing articles, but most sites fail to really wow – but to keep it interesting for the consumer the reward must be unpredictable. It turns out that our brains are hardwired to find patterns in things and when rewards vary we are compulsively drawn back by a need to find some order. Variability makes us value rewards more and makes sites more addictive. Returning to Facebook and Twitter – the rewards on any given visit vary hugely, and sometimes there are none. Similarly on Instagram – who knows whether people will love your photos or not. The fourth and final step is commitment. Having enjoyed a reward the users brain is swimming with dopamine and they are happy to do a bit of work and put something back in. Putting something back in should serve two purposes – firstly to make the service better next time they use it, and secondly to get the user to feel more invested in the service and hence committed to it. Dressing avatars, buying virtual goods in games, adding profile information and updating preferences are all good examples of work that users can be asked to do. By now you may have picked up that there are two types of triggers – internal and external. External triggers are manufactured by the service, and include emails, social media mentions and adverts. Internal triggers originate in the mind of the user when a service becomes associated with thoughts or emotions that occur spontaneously – e.g. read an interesting article, post it on Twitter. Nir’s second major insight is that successful sites drive super growth by transitioning users from relying on external triggers to responding to internal triggers by taking them through the desire engine a few times. In summary, the key challenges are finding compelling and variable rewards, getting users to commit by doing some work, and designing a user experience that cycles users through the four steps quickly to encourage the development of internal triggers. Finnish company RapidBlue has released the results of a study showing that Google Adwords campaigns result in increases in visits to stores and time spent in stores. The study looks like it was pretty thorough. Researchers took data from Royalblue’s proprietary technology which tracks mobile phones in retail outlets and output data from EPOS systems, and then correlated both these data sets with spend on Adwords campaigns, whilst controlling for a host of other variables. You can read more detail on Venturebeat. This research is great, but it stops short of true online to offline attribution of the sort that the deal between Yahoo and UK offline loyalty card scheme Nectar promised back in 2010. That would be a huge step forward. Most businesses figured out a long time ago that delivering good customer service is a pre-requisite for long term financial success. If you’re like me you will have noticed that more and more often issues can be sorted out with a single email or phone call (although some providers remain frustratingly awful at looking after their customers – particularly banks and telecoms companies). A quick history of the phrase ‘the customer is always right’ is illustrative here. Use of the phrase dates back to the early 20th century when the concept was championed by a few visionary firms (including Selfridges here in the UK), then by the beginning of this century management were pushing the idea so hard that comedians derided it as a cliche, and now it has become so widely accepted that people don’t really joke about it. However, all of this progress hasn’t really made its way into the world of advertising yet. Back in 2008-09 I wrote a few posts about Vendor Relationship Management (VRM), a conceptual framework for improving the customer experience of being advertised to which turns the traditional advertising model on its head by putting the customer in control of the adverts they see. In theory this should be better for everyone – the customer only sees ads that are relevant to things they want to buy or do, and the advertiser can avoids the waste of advertising to people who aren’t interested in their product. Doc Searls and the other proponents of VRM have sketched out a technical architecture for the services that are required to make this vision a reality, the most important element of which is a personal datastore for each consumer which tells advertisers which products and services they are allowed to advertise. The datastore contains rich profile information which is valuable for advertisers, but the contents and access to the datastore are controlled by the consumer, who may choose to see no ads at all. I stopped writing about VRM in 2009 when it became clear that the practical challenges to implementing VRM were such that we were unlikely to see any successful startups in this area in the short term. I think the biggest challenge is getting consumers to engage with the concept, both by contributing to a personal datastore and then by updating their preferences so advertisers know what they might want to buy. For a service to work the data needs to be captured and the preferences inferred without any effort from the consumer, and to my knowledge nobody has found a way to do that. I still believe in this vision of the future though. It is much more efficient than today’s advertising which, despite much improved targeting, is still mostly irrelevant to the consumer and increasingly simply not seen. I’m writing about this now because I just read an interview with Doc Searls about his new book, The Intention Economy. The interview is a good reminder of the problems with the existing advertising system and how things will look different in the future. As I say, I still believe in the vision of VRM, but equally the path that gets us there still isn’t clear. I think developments in smartphones and intelligent agents are bringing us closer to the point when that clarity will arrive though, and I’d be happy to hear from any startups working in this area. There has been a bit of buzz recently about the Q2 increase in VC activity in the US, and following discussion a discussion at a dinner last night where we fumbled for stats on the state of the venture market I decided to do a little research this morning and find out the latest trends. As you can see from the charts below, it turns out that the level of venture activity in Europe is increasing slightly, particularly on the side of funds raised by VCs to invest into startups. The US is growing more strongly, and activity over here is still only a fraction of what it is over there, even though our economy is bigger. Deal volume in China has continued to decline. There is a seasonal pattern to fundraising by VCs with more activity usually occurring in the second half of the year, so the thing to look at in these last two charts is comparison between 2Q12 and 2Q11. That is where you see the growth. And, for those that were wondering, tthe dinner was organised by Mike Butcher and Alena Dundas and kindly hosted by Propel. The flow, as I see it, works like this. Our advertisers want as much data about, and contact with, our users as possible. We want to only allow limited engagement. Either advertiser interest wanes (Flickr), or we coast on our investment (Twitter, Tumblr), or we give in and let the advertisers run the show (pretty much everyone else). Members become angry at us because we’re selling them out. The exodus begins. There’s always somewhere else to go (see Friendster, MySpace). Go back to step 1. See it? The bigger you go, the harder the road. Were you a big Gowalla fan? Did you like Dodgeball? Did you think Trunk.ly (gasp!) was better than Pinboard? Did you make a lot of contributions to Nextstop? Do you miss Aardvark andEtherPad? Did "I Want Sandy" change your life? These projects are all very different, but the dynamic is the same. Someone builds a cool, free product, it gets popular, and that popularity attracts a buyer. The new owner shuts the product down and the founders issue a glowing press release about how excited they are about synergies going forward. They are never heard from again. Whether or not this is done in good faith, in practice this kind of ‘exit event’ is a pump-and-dump scheme. The very popularity that attracts a buyer also makes the project financially unsustainable. I think there is something in this. Facebook and LinkedIn are highly profitable free social networks, but I can’t think of any others. I can however think of many that are very popular, but not making money – Twitter, Tumblr, and Pinterest spring to mind. Four or five years ago the list of free social networks that were popular but not making money was equally long, but totally different. Back then I might have listed Bebo, Myspace, and Friendster. Of these three, two sold out for what seemed like big headline prices at the time before going into terminal decline and the third (Friendster) slowly faded into insignificance. The most common explanation for this is that they were fads, but maybe the tension between user experience and profitability had more to do with it. From Flickr to Instagram, over the last ten years building large but unprofitable social networks and selling them to large corporates has been a lucrative business for entrepreneurs and their VCs, but it hasn’t usually worked out well for the acquirers, or more accurately their shareholders. This imbalance won’t continue forever. I think the two ingredients for change are acquirers getting smarter about assessing whether their target has the magic to be one of the very few that monetises like Facebook or LinkedIn, and reduced valuations on the public markets for acquirers (high dollar value acquisitions look cheap to CEOs of companies with highly valued stock). The first of these ingredients isn’t far away, and may even be in place already. The second is harder to predict. The implications of this analysis, which I’m not yet wholly sold on, is that the odds of winning the ‘get big really fast’ lottery are in decline. This is a bit counter-intuitive given recent successes at Instagram and Pinterest, but it is important to remember the large numbers of Pinterest wannabees and avoid being deceived by selective reporting and success bias. Bonus extra: When he’s not writing about social networks Derek Powazek edits a quarterly book of true stories and original art called Fray. It’s rather good.